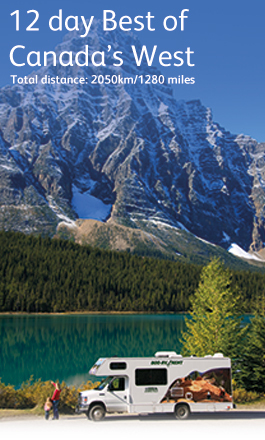 Motorhome holidays offer the ultimate freedom to explore Canada’s great outdoors. With total independence, allowing you to experience the magnificent scenery at your own pace, they are a cost effective way for families and friends to explore all that Canada has to offer. Relax in the comfort and security of your own ‘home’ and go where you want, for as long as you want. Campgrounds are plentiful and many are of a very high standard, offering swimming pools, restaurants and entertainment. Facilities and style of motorhomes vary, so this information is for guidance only. Drivers must be over 21 years of age and in possession of a valid driver’s licence and credit card. Cruise Canada depots are open Monday to Saturday, excluding all Canadian public holidays. If arriving on international flights it is necessary to spend one night in a hotel prior to collecting your vehicle. Pick-ups 1pm - 4pm; returns 9am - 11am. Transfer to depot is not included unless the Early Bird Departure special is booked. One ways are available, fees are variable and our consultants will advise costs at time of booking. Cruise Canada has rental locations in Vancouver, Calgary, Toronto, Montreal, Halifax, and in Anchorage, Alaska. You can pre-book blocks of 100 miles for approx £20 each or 500 miles at approx £99 per block. Alternatively you can pay on a per mile basis at the end of the rental. An unlimited mileage plan is available at approx £690 for 21 days. Unlimited Mileage Plus: Includes unlimited kilometers, one vehicle departure kit, one personal kit for each passenger and unlimited use of the vehicle generator, if applicable. The cost is £887 for rentals up to 21 days. For each additional day, there is an extra charge of £29 per day. Cruise Canada operates a flexible pricing system which is designed to give you the best rate. It works on the simple laws of supply and demand, so the earlier you book the less you will pay. Our consultants will advise you on the cheapest price; being flexible on the size of motorhome, pickup location or day can make a big difference to your holiday cost. This pre-paid offer allows guests to arrange an earlier pick-up (9am-midday) and a later drop-off (up to 3pm), and includes return hotel/depot transfers for all members of your party. This early bird offer must be booked at least 30 days in advance. Prices from £240 for the entire party. Half-price one way fees, 25% off unlimited mileage or 25% off Unlimited Mileage Plus, free vehicle kits, depending on when you travel. Day 1: Vancouver Stay at Burnaby on the city outskirts. Visit Vancouver, one of the most interesting and beautiful cities in the world. Days 2 & 3: Burnaby - Okanagan Head along the Transcanada Highway for the Okanagan Valley providing the opportunity to visit many of the valley's vineyards. Day 4: Okanagan - Revelstoke Visit Salmon Arm, the gateway from the Okanagan in the heart of the Shuswap Lake recreation area. Days 5 & 6: Revelstoke - Lake Louise Visit the Kicking Horse River where it flows below the Natural Bridge in Yoho National Park. Take the scenic drive along the Bow Valley Parkway to travel between Banff and Lake Louise, it is a quieter less busy route with plenty of hiking trails and vista stops. Take a trip on one of the gondolas to Sulphur Mountain and then enjoy a soothing soak in Banff Hot Springs. Days 7 & 8: Lake Louise - Jasper via Banff Visit the Athabasca Glacier where you can ride out onto the Glacier aboard an ice Explorer or take a guided hike on the ice. Whilst in Jasper be sure to book The Maligne Lake Cruise where you will also cruise to Spirit Island, the crown jewel of Jasper National Park, an iconic photo stop. Day 9: Jasper - Clearwater Visit Clearwater, an interesting town at the gateway to Wells Gray Provincial Park. Days 10 & 11: Clearwater - Vancouver Visit Stanley Park, the Harbour Centre, Granville Island, Capilano Suspension Bridge, Grouse Mountain and so much more. Day 12: Vancouver - Departure Return your motorhome in the morning. Days 1 & 2: Toronto - Niagara Falls After an over night stay collect your motorhome from Toronto and head to the thundering Niagara Falls. 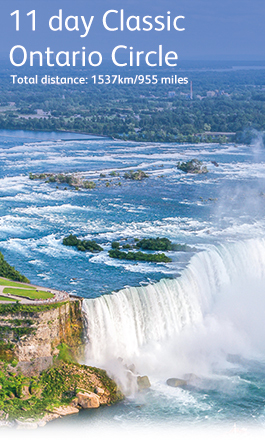 Take a journey behind the Falls or an iconic boat cruise in the swirling waters below. Days 3 & 4: Niagara Falls - Georgian Bay Your next port of call is Wasaga Pines Resort on the rugged shores of Georgian Bay. Wasaga Beach is the longest freshwater beach in the world. The crystal clear waters of Georgian Bay are synonymous with water activities such as kayaking and even shipwreck diving! Days 5 & 6: Georgian Bay - Algonquin Provincial Park Heading northeast to the famous Algonquin Provincial Park offering hiking trails and canoe routes for all ability levels. Watch for wildlife too - sightings are plentiful here! Days 7 & 8: Algonquin Provincial Park - Ottawa Travel east to the vibrant city of Ottawa, Canada's federal capital. You'll need a full day to explore this beautiful city, which is home to many cultural and historical sites, galleries and museums. Day 9: Ottawa - 1000 Islands Explore the exquisite beauty of the 1000 islands, best seen on a cruise sailing past tree-clad isles, palatial waterfront homes and quaint island cottages. Day 10: 1000 Islands - Toronto Your journey will end on a high in Canada's hip and happening metropolis of cool. This city does not disappoint - everything from world-class arts and culture, shopping, dining & entertainment. Day 11: Toronto - Departure Return your motorhome in the morning. Why not extend your stay in Toronto and really get to explore the city?